Bookmarking service Read It Later has released new statistics detailing the performance of its smartphone and tablet applications, highlighting a significant rise in Android downloads and dispelling the myth that Android users do not like paid apps. In a new blog post, Read It Later said that over the holiday period, device registrations for the service grew by 148% from November to December, monitoring downloads on the iPhone, iPad, Android, Kindle Fire and via the Firefox browser. Reinforcing claims that Amazon’s Kindle Fire was a popular Christmas gift, Read It Later saw 12.5% of its total Christmas Day registered to users of the retail giant’s new tablet device, with 17% of new users registering the application on the following day. Despite registering a lower share than iPhone, iPad and total Android devices, the device still accounted for almost one in seven registrations over the two days. Read It Later’s data also helped to buck the trend that associates Android users with a dislike for paid applications. 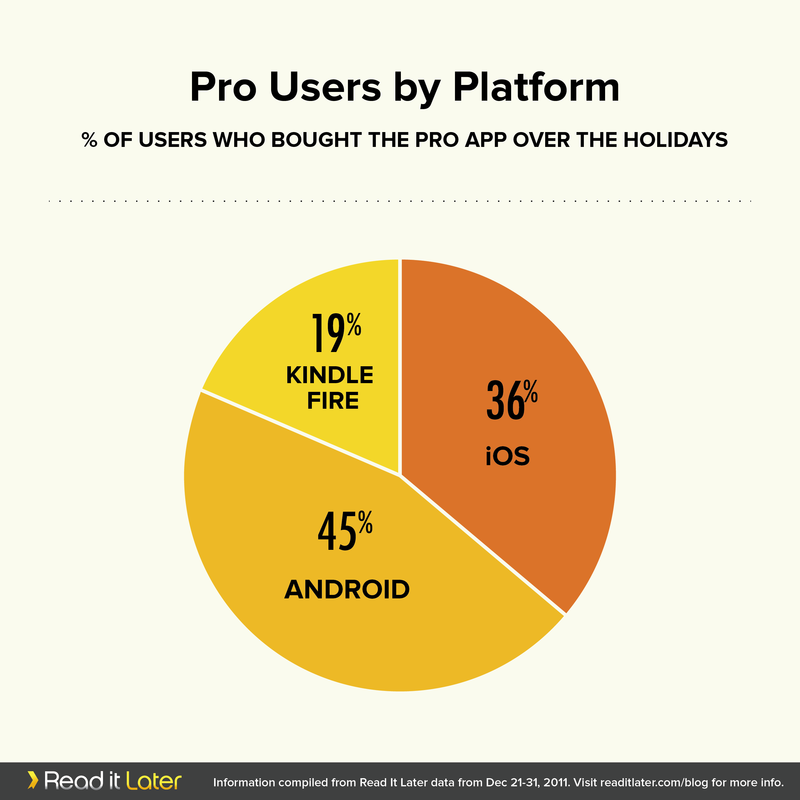 The service saw 45% of its users come from an Android device with an additional 19% coming from the Kindle Fire — ensuring that two-thirds of Pro usage came from an Android-powered device. Of the users that registered their device over the holiday period, 46% of Android users opted for the Pro version, compared with 25% on iOS. In December, Read It Later released some interesting statistics not only on how its service was being used, but where it was being used. With its 4 million registered users, the company recorded more than 47 million clicks between May and October, a 37% increase from the previous period. The data was then broken down to find out the most popular authors, and which had most loyal audience, while also providing a comparison between bloggers and long-form writers. Out of the top 10 most saved authors on Read It Later, 9 of them wrote for Lifehacker. Read It Later insists that it will continue to evolve its service to encompass all of the new devices expected to launch over the next year, to provide a service where users “can access their content wherever they are”.